Come and join me for an imaginary trip to one of the greatest cities on earth! This phenomenal city defies easy labels and trite descriptions, but it is a place worthy of spending time to learn about its many facets. It seems a sketchbook is a great way to start that exploration as it give you the chance to pause and look beyond the surface, to go deeper. How does one capture all that is Paris on the pages of our sketchbooks? One doesn't! Instead, capture what enchants you and leaves an impression on you. Paris is far more than one sketchbook or even ten. Capture the memories and experiences that make your heart beat a little faster or leave your breathless. It takes working quickly, often forgoing accuracy for speed. It takes leaving out details and getting down to the essence of what really speaks to you. Welcome to An Imaginary Trip To Paris, Part 2! In the next four weeks, we’ll visit some of Paris' less touristy areas as well as some offbeat places. I'll also be sharing my sketchbook and the pages I created while there in October of 2018. We'll explore different techniques and ideas together to help you on your creative journey towards sketching on location. Come and join the fun of this next adventure! Learning to create "memory sketches"
This class is focused on building your quick sketch skills for drawing and painting as if we were actually in Paris. Imagine stepping off the bus and being told we’ll be moving to our next destination in 30 minutes. That means you have thirty minutes to get something down on the page—once you find what you want to sketch! This part of the class is strictly optional. If you just love to draw and paint, you can always ignore the suggested timeframes and create at your own pace. Video demos are provided for all of the assignments. All techniques are shown so that you can “see” when and where they’re used. You have total flexibility as to when you watch the videos once they are posted. The demos are available for the duration of the class and you can watch them as many times as you like. Some “travelers” find it helpful to paint along with the video, pausing it as needed to learn the techniques Laure is demonstrating. Others watch the video and then apply the techniques to a photo reference of their choosing. The recommended art supply list can be found here. Laure Ferlita is an accomplished watercolorist residing in sunny Florida. Watercolors, nature, travel, painting on location, sketching for the joy of it, and most especially, color, are her passions! Vibrant color can be found in almost any subject and its shadows. It is her joy to bring those colors to life on paper with some paint and a little water. For many years, Laure worked as a graphic designer, so you will most likely see a strong graphic element in her work. 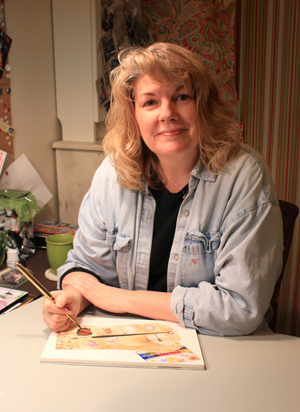 She started sharing her joy and love of sketching on location over at ImaginaryTrips.com in 2009 and has helped many "travelers" to find their artistic voice since then. “Watercolor, for me, is the perfect sketching medium." Laure says. “It provides ease of use, quick color saturation, and clean up is a snap and really, you don't need much equipment. After you move past the hype of how difficult watercolor can be, you find out how much fun it is to get out there and actually create on location. It's way too much fun!" To see more of Laure's work, you can visit her web site at www.LaureFerlita.com or see what's on the art table today by visiting her blog, Painted Thoughts. The course starts on February 15, 2018. An assignment will be posted once-a-week for four weeks. The class format option you choose will determine the end date of the class. The class format option you choose will determine the length of your access to the class materials. The Interactive Class ONLY ends on March 22, 2018. The Independent Learning Class ONLY will end on March 22, 2019 or later depending on the date of enrollment. The Combination Class will end on March 22, 2019. We would never want you to be unhappy! If you are unsatisfied with your purchase, contact us within the first 4 days after February 15, 2018 OR the date of your purchase if you opted for the Independent Learning Class ONLY and we will give you a full refund. The artist will have access to the class materials for one year from the date of class start* (August 23, 2018). All handouts can be downloaded and kept. Videos can be watched as many times as the artist wants, but are not downloadable. *If the artist signs up for the class after August 23rd and before September 6th, the class materials will come online in a one-assignment-per-week format. If the artist signs up for the class after September 6th, all materials are available upon enrolling.